Summary: How can we best support English learners in classrooms where rigorous curricula focus on intellectual practices across content areas? How can we engage in practices that enable students to construct rather than reproduce knowledge, develop deep understanding of disciplinary knowledge and forge connections between school and the outside world? In this review of Pauline Gibbons’s book, Debra Schneider shares insights and successful strategies emerging from her own “high-challenge, high-support classroom” practice and the work of her study group related to their reading of the chapter on Academic Literacy [see PDF]. An excellent resource for individual classroom teachers, study groups, inquiry groups, or those leading professional development. I am going to make a confession. This year I abandoned teaching a California history–social studies standard about the great religious revivals in American history in order to spend more time teaching America’s founding documents, especially the philosophy in the Declaration of Independence. That is, guide students to construct knowledge, not reproduce it; develop students’ deeper understanding of content area knowledge; and connect school knowledge to the world outside school. Most helpful to me were her examples of “intellectual practices” across content areas, with specific examples in history, music, science, math, and more. I also appreciated her discussion of nominalization (e.g., the noun form of verbs) and nominal groups in academic writing. She points out the features of academic language that limit comprehension, while arguing that we must explicitly teach disciplinary academic language to give ELL students access to the disciplines. The chapter “Engaging with Academic Literacy: Examples of Classroom Activities” (linked above) influenced my teaching work the most. I used the Split Dictation strategy in our study of early American imperialism to help students focus on content as well as language forms. The class was given two political cartoons along with a cloze text (a text from which words have been removed and replaced with blank spaces) that described the two artists’ message about expansion during the Spanish American War. The students worked on the cloze text in groups. This strategy helped students learn “about language in the context of using language.” We could refer to the language and how the authors made meaning, as well as the content—America’s desire to acquire new territory. In the chapters that follow, Gibbons gives more specific strategies for scaffolding reading, writing, and talking about academic text. Many of the strategy descriptions include examples of students’ language and responses, which I found helpful when planning my own use of these methods. 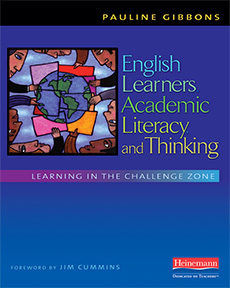 English Learners, Academic Literacy, and Thinking is an excellent resource for book study groups. A group at the Great Valley Writing Project, my local site, read the book as part of a Saturday morning book study group. Gibbons’ assertion that teachers need to teach content more deeply provoked discussion about how this could be done. The one point teachers revisited over and over during the study group was how to make the choices about what standards to teach in depth. Gibbons provides discussion-provoking questions and a list of suggested readings at the end of each chapter. Know ELLs, an online community of teacher-consultants teaching English language learners (for more see A Social Networking Space for Teachers of English Language Learners), read and discussed Gibbons’s book in the fall of 2009. We used her questions and linked to as many of the suggested readings as we could find online to deepen our study and understanding of the book. My high school’s changing demographics are bringing more ELL students into our classes, challenging teachers to change their teaching methods and ideas about students’ learning. This book would be a good resource for a school staff like mine that needs more support in working with ELL students. It is filled with rich, deep, and thoughtful ideas that have directly influenced the ways I think about my classroom work with students. About those standards? Honestly, I think there will be little or no difference in my students’ scores on our state’s standards test, but a big difference in my students’ real knowledge about the topics we studied and about the world. I feel confident that I’ve done the right thing by my students and thank Pauline Gibbons for the push to do it.